Arrested Motion (AM): We see that for this group show you have some pieces that are oil and ink on tea-stained paper rather than the predominantly canvas pieces you had at your last show. Can you compare working on these different mediums and any plans to work on wood like some of your earlier work. Stella Im Hultberg (SIH): I did want to take some time off canvas and do some delicate detail works. There is such a vast difference between working on canvas and working on paper, of course. On canvas, I can let loose and build layers and make mistakes. On paper, i have to be a little more planned, more careful. I do find beauty in both… It would be wonderful to figure out some new surfaces. Wood would be a great surface to have, but unfortunately, living in New York City doesn’t afford me much room for cutting wood. I’m definitely taking a few weeks to explore new areas, so there’s room for some new things, I’m sure. AM: We haven’t seen you do many collaboration pieces in the past. 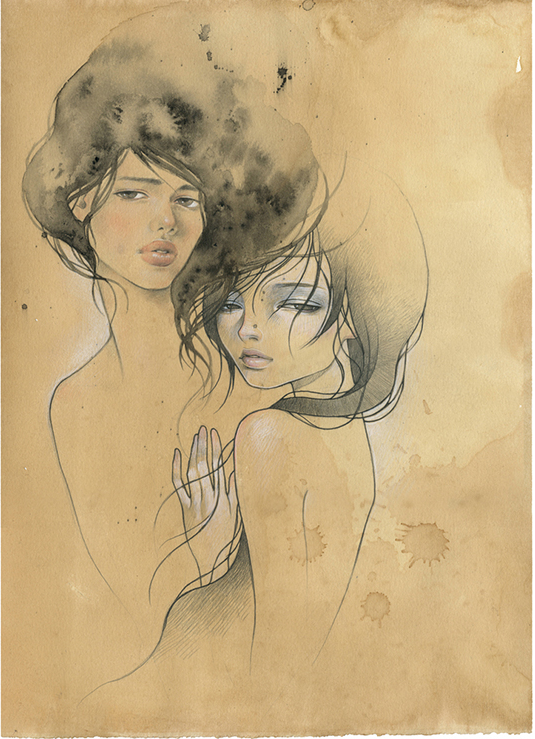 How was the experience like working on one for “The Drawing Room” show with Audrey Kawasaki and do you plan to do more collaborations in the future? AM: What shows and projects do you have planned for 2009 that you can share with us? SIH: I will be starting the year with a show at Roq La Rue in February … and then a small piece in the Kokeshi exhibit, then a solo back at Thinkspace Gallery. I will have another small solo in November at Copro Nason as well. AM: Thanks for taking time to answer some quesitons for us. Best of luck with this show and 2009. See all the pieces from the show here. Discuss Stella Im Hultberg here. Categories: Art, Features, Interviews, Low Brow & Pop Surrealism, Previews, Shows & Events. Tags: Features, Interviews, Low Brow & Pop Surrealism, Shows & Events, Stella Im Hultberg.